Quicklime is utilized by the steel industry to effectively remove phosphorus, sulfur and silica in the basic oxygen furnace and electric arc furnace. 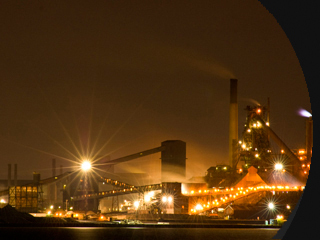 Electric arc furnace steel makers may also use a ladle metallurgical furnace as a secondary refining process to produce cleaner steels for more demanding applications. In this process, quicklime provides the proper slag conditions to further remove steel impurities, lower oxygen content and remove inclusions. Basic oxygen furnace steel makers accomplish higher quality steels through the use of a vacuum degasser that also uses lime. Hydrated lime is also utilized by steel producing facilities in the neutralization of sulfuric acid-based wastes produced by the steel pickling process.